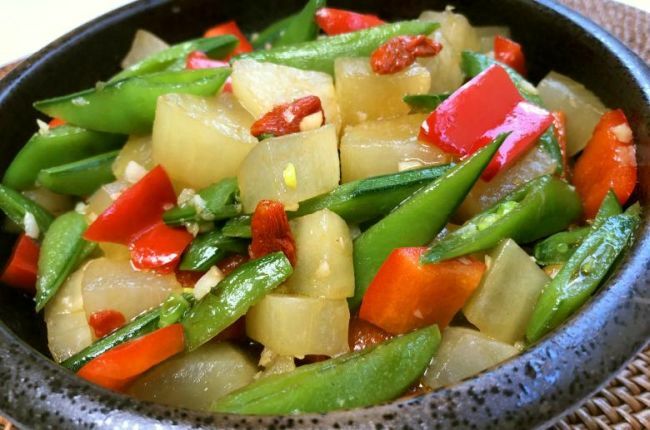 Simple to cook, this yacon stir-fry can perk up your weekday or festive dinners. With red and green accents from the bell pepper and sugar snap peas, I dare say this dish can hold its own as a respectable side dish for Christmas. Sold as "xue lian guo" (snow lotus fruit) in the market, yacon is native to the Andes and has been the subject of research into its health benefits. It contains fructooligosaccharides, a form of carbohydrate that is low in calories, and its syrup has been used as a natural sweetener. In texture and taste, I find it similar to the turnip bang kwang. It is sweet, crisp and refreshing. It is also a versatile ingredient that lends itself to a variety of cooking methods. This is my third recipe in this column featuring yacon. Go to TNP's website to find my recipes for a savoury soup of yacon and pork ribs and sweet dessert yacon soup with snow fungus. This week's yacon stir-fry is a healthier option you can add to your festive dinner. 1. To prepare the sugar snap peas, remove the strings on both sides of each pod. Rinse and diagonally slice each pod into four pieces. 2. Bring 400ml of water to a boil. Add a pinch of sugar and place sugar snap peas in the water and blanch for one minute. Drain the water and set the sugar snap peas aside. 3. Prepare a bowl with 400ml water and ½ teaspoon of salt, to soak the yacon. 4. Peel the yacon, cut it into 2cm cubes and place them in the salted water. 5. In a wok or frying pan, heat two tablespoons of cooking oil. 6. Add the chopped garlic and fry for 45 seconds until fragrant. 7. Add the sugar snap peas and fry for 45 seconds. 8. Add the yacon and fry for 30 seconds. 9. Add the red bell pepper and oyster sauce and stir-fry for 30 seconds. 10. Add the wolfberries and cornflour mixture and stir-fry for 30 seconds. 11. Transfer to serving dish and serve hot.